Banking Players can choose from 16 deposit methods and 16 withdrawal methods. Summary dublinbet is unique amongst our Live casinos as it's the only one which offers a live 24/7 feed from within an actual casino - the famous Fitzwilliam Casino and Card Club located in Dublin city centre, Ireland. They also offer a 12 hour feed from The Palace Casino in Douglas, Isle of Man. 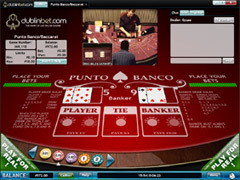 Whereas some of the other casinos offer feeds from within a genuine casino setting, dublinbet is the only one which features real-life players alongside the dealers. Although they only offer three games (Sic Bo and Dragon / Tiger are not that popular in Ireland, it seems!) they offer the best Live Baccarat available, with unlimited seats, 180 games per hour and a maximum bet limit of £1600. Table limits Minimum £0.10, Maximum £1600. Available tables dublinbet offer unlimited tables, so Baccarat is available 24/7. Game speed Each game takes an average of 20 seconds, giving 180 games per hour. Summary An astonishinlgy quick version of Baccarat. Games are every 20 seconds leaving little room for study or thought. Available tables dublinbet have one Early Payout table to play on bu this is only open between the hours of 16.00 and 04.00. 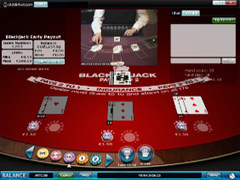 Summary Early payout provides players with a unique opportunity to cash out before the hand is completed. Unfortunately the casino is not open 24/7 and so this opportunity is limited. Table limits Minimum £0.10, Maximum £25. 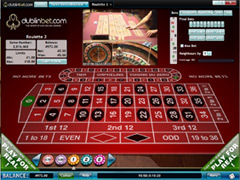 Available tables dublinbet has unlimited tables with differing stake limits for Roulette. Game speed Each game takes an average of 50 seconds, giving 72 games per hour. Summary A fast game from their own casino, the table has different bets on offer than other casinos e.g red split, black snake. The information box is excellent for betting purposes.